For all of our Customer’s Construction Needs! At Cowan & Thompson Construction, Inc, our mission is simply to be the best in the region. Our highly-trained staff are committed to delivering the finest possible service. We value our relationships - with our customers, vendors and every member of the C&T Team. Thanks to our dedicated staff, Cowan & Thompson has built a solid reputation for exceptional attention to detail, unrivaled customer satisfaction, and flexible scheduling. 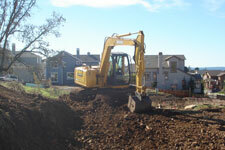 • Retaining Walls - We are one of California’s leading retaining wall contractors. • Concrete Masonry Walls - Cowan & Thompson offers full service CMU installation. • Gravity Walls - Full service gravity wall installation. • Landscaping - Installation service and site maintenance programs. • Erosion Control - Installation and continued maintenance programs available. • Prep & Detail - Cowan & Thompson has specialized teams of trained personnel available. • Trucking - We have the equipment and expertise for your trucking needs. • Products - Installs are completed using all the major product lines. • excavation, sub-drainage, erosion control, fence replacement, de-watering, etc. • Installation of Filter Media - Removal of old media and support gravel; Install & test new media. Contact us today, to learn more about how Cowan & Thompson can exceed your expectations.